I used an amazing program to plan this quilt, but let’s start with the background story. Some friends of ours are about to have a baby girl. The mom-to-be loves pandas and watched baby Bao Bao on the National Zoo’s Giant Panda Cam almost every day when it first came out. The dad loves computers. 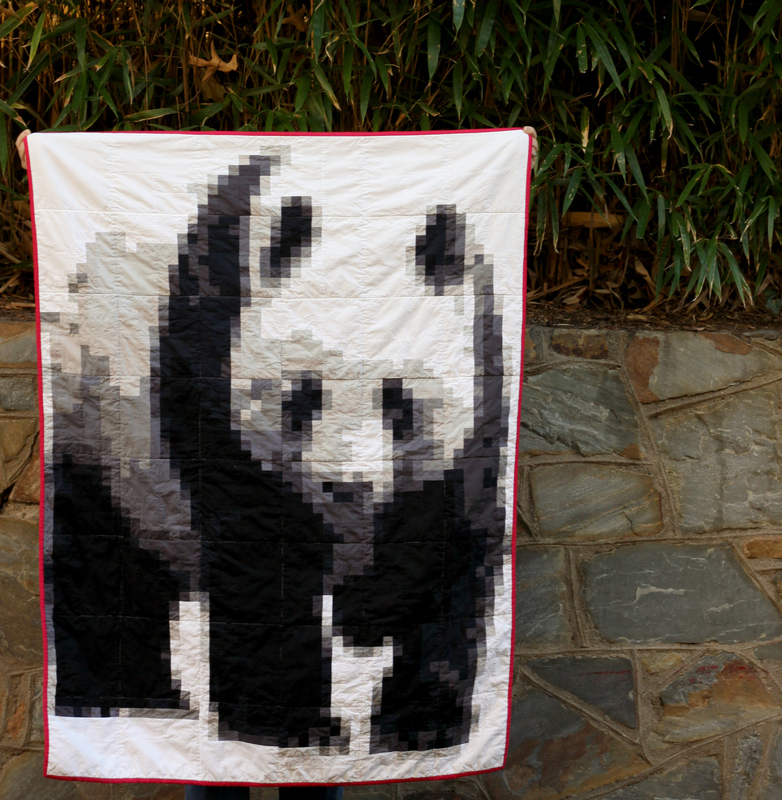 To marry the two interests, I thought a pixelated panda quilt would be perfect! 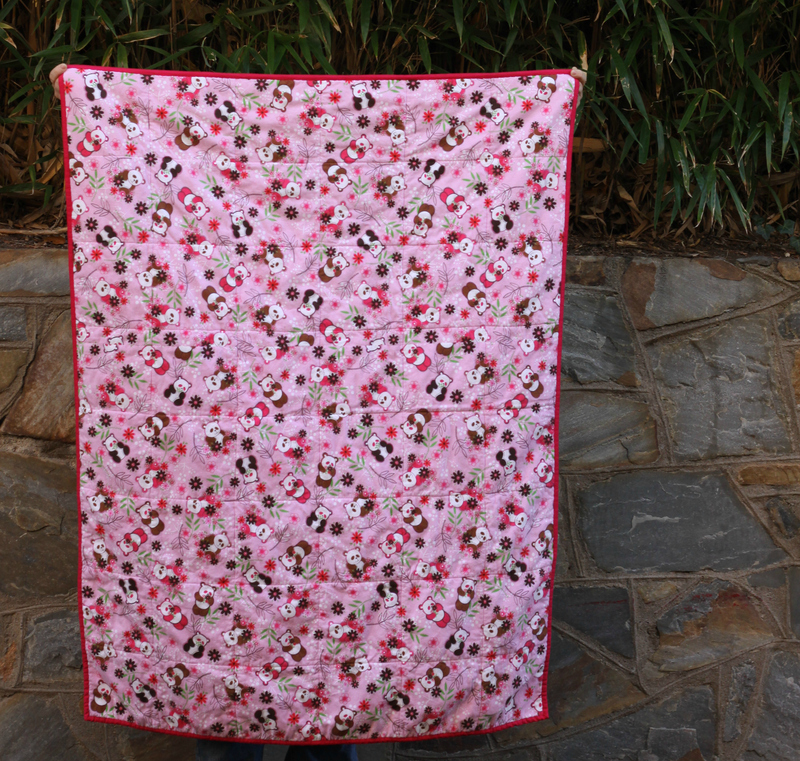 I didn’t want to make the quilt too girlie, so pink on the front side of the quilt is relegated to binding. On the back? More pink… and a lot more pandas! For once, I even remembered to include care instructions and a gift tag (back side, not pictured). I kind of hate making labels and I’m not really sure why. I pretty well destroyed our apartment while I was working on this one. There were various-sized pieces that covered our kitchen table. Each time I finished a block, I washi taped it to the wall. I had little sections ALL OVER the apartment. I think the finished quilt was worth the mess! While I still hate chain piecing, the program I used made it as painless as possible. Does anyone here remember the tutorial I wrote about how to turn a photo into a pixelated quilt? I really enjoyed the manual process and it’s FREE… but you guys, I don’t think I’d ever do it again. 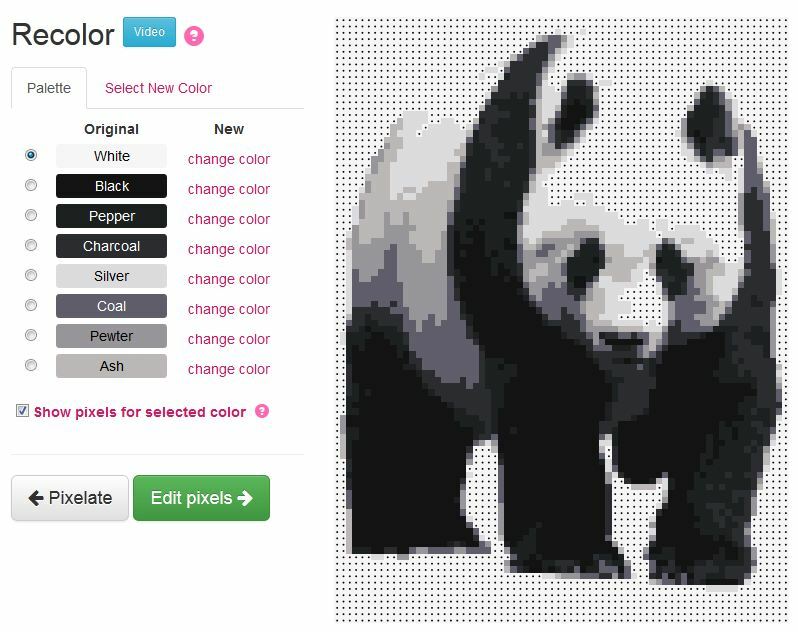 The year after I published my tutorial, a husband and wife team developed a website called YouPatch that does the pixelation for you. Maybe you’ve heard of it. I’ve seen other bloggers write about it, but after trying it for myself, I wanted to tell the whole world how amazing it is! They’re not paying me to write this. Their website is just AWESOME. 1. Upload the photo you want to turn into a quilt. 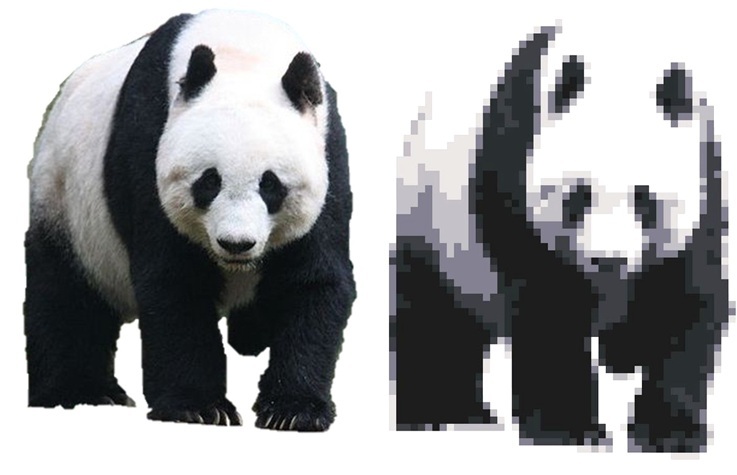 I used a photo of a panda, removing the background. Eliminating the background makes the main subject of the photo really stand out. I was also pleased that YouPatch did a great job with my poor quality photo! Once the photo is uploaded into YouPatch, you decide whether you want the orientation of your quilt to be portrait, landscape, or square. I picked portrait. 2. 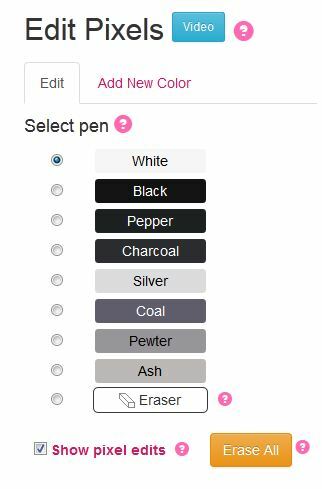 Pick how many fabric colors you want to use. I chose 8 for my quilt. The current maximum number is 15. 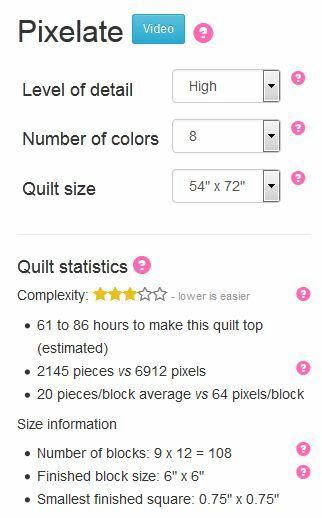 The higher the number, the more detail in your quilt… and also the more work you have to do. You get to preview the difference for each option, which is insanely cool. I would have been happy with fewer options, but I really liked the control this gave me. 3. Pick a finished quilt size. Why? you might ask. 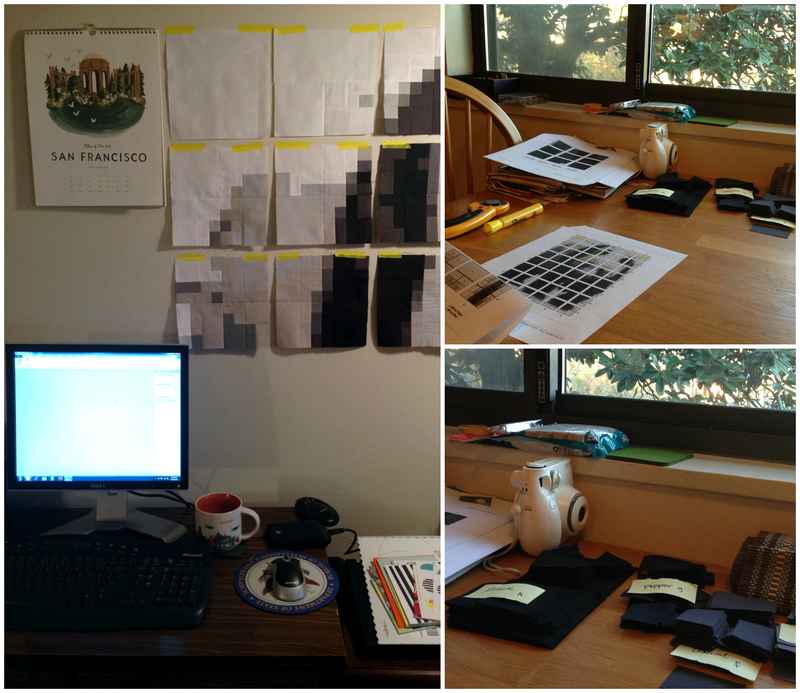 Can’t I just use the grid of pieces the software generates to do my own sizing? Well, yes. But a few things: (a) you’re crazy if you want to do quilty maths that the program would do for you; and (b) based on the size you select, the program will tell you how much fabric to buy! You also have the option to manually change a pixel, which is cool. If I hadn’t deleted the background on my photo before uploading it, I would have used this feature to manually remove any distracting details. Then you just pay for the pattern (less than $10 for me), and they email it in pdf format. Mine was very detailed, with 17 pages of instructions, illustrations, and ideas. I didn’t need all the provided info, but it was nice to gauge whether I was on the right track at times. I wondered was whether each pixel would be an individual, standard-sized square or whether YouPatch would group side-by-side pixels of the same color. Probably I could have researched this in advance, but I didn’t. They do #2 (grouping). I love this. The pattern tells you what size blocks to cut. Due to grouping, not all pieces are the same size. I received another email when I was about halfway through sewing this quilt that said the grouping has been even further improved. There’s definitely a balance between grouping as many pieces as possible so there is less sewing and trying to ensure the pieces can be assembled into standard-sized blocks that don’t require you to read a complicated “map.” I did some minor adjusting on my own but would be interested to see the changes. 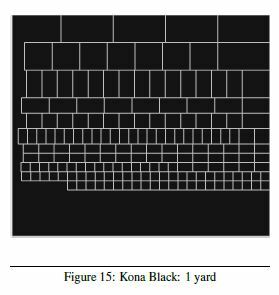 The pattern also gives you layout ideas for each fabric color to ensure all your blocks can be cut from the amount of fabric recommended. Once your pieces are cut, the pattern the shows you how to assemble the pieces into equal-sized blocks. Put the squares together and voila! Finished quilt! There are plenty of instructions if you’re new to quilting. I got by using only the grid (pieces to blocks assembly) because it was clear on its own. Yay for feeling like a pro! The customer service was great, too. I actually received a follow-up email about an hour after I received my pdf pattern that contained some suggestions and even a second pattern choice. If I hadn’t already decided to review YouPatch, this would have been the clincher. Yes, I elected to sew way too many pieces on a deadline, but I loved using YouPatch and I really like the finished quilt. If you’re thinking of trying it, I can definitely say I recommend the YouPatch program. Categories: Quilts | Tags: baby blanket, baby girl, baby quilt, bao bao, baobao, binding, care instructions, china, chinese panda, giant panda, giant panda cooperative research and breeding agreement, girl quilt, how to, kona, kona cotton, label, national zoo, panda, panda cam, panda exchange, panda fabric, panda quilt pattern, pandacam, pink, pixel quilt, pixelated portrait, pixelated quilt, pixelated quilt tutorial, portrait, portrait quilt, quilt, quilt care instructions, quilt label, quilting, quilting cotton, robert kaufman, robert kaufman kona, sew, sewing, smithsonian, smithsonian zoo, you patch, you patch review, youpatch, YouPatch review | Permalink. Thanks for the great review Tiffany.